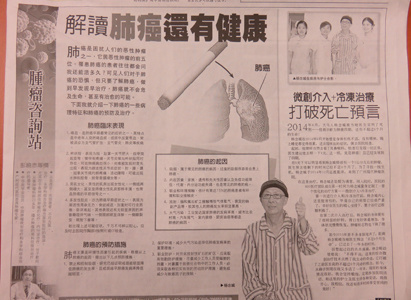 On November 22nd, 2015, China Press published a report about Modern Cancer Hospital Guangzhou, which introduced the clinical manifestation, prevention of lung cancer, as well the anticancer story of lung cancer patient DJONG NYAM SANG. Professor Peng remained people to pay attention to the symptoms like hemoptysis, clubbing fingers, multiple myositis, etc, because these symptoms are the common symptoms of lung cancer. Once symptoms are found, one should go to hospital for examinations as soon as possible. Professor Peng also introduced the prevention measures, including no smoking, protecting environment, occupational protection, etc. At last, Professor Peng briefly introduced the anticancer story of a lung cancer patient named DJONG NYAM SANG. In August 2014, DJONG NYAM SANG was detected with lung cancer in Malaysia. Doctor told him and his family that he could live no longer than 6 months. His wife found Modern Cancer Hospital Guangzhou on the internet and was attracted by its advanced minimally invasive therapies and high quality services. After thinking twice, in December 2014, they decided to take cancer treatment in China. The MDT (Multidisciplinary Team) of Modern Cancer Hospital Guangzhou quickly made a special individual therapeutic plan for him: interventional therapy+ cryotherapy. Since DJONG NYAM SANG did not know much about minimally invasive therapies, he was nervous and scared before taking interventional therapy and cryotherapy. Fortunately, the success and good efficacy of interventional therapy and cryotherapy help him overcome the fear. After the second session of interventional therapy, his condition turned better, his weight increased, his appetite became better and his tumor marker reduced. Here comes the end of 2015, one year passed, DJONG NYAM SANG still alive, he breaks doctor’s death prophecy of 6 months. Now, his condition is under well controlled.